It seems like time goes by so quickly anymore. It’s like yesterday we were ringing in the New Year and now just a little over a month away from Easter. BTW did you know Easter is on April 1st this year? Weird right? Anyways I am here today to kick off this year’s Easter crafts series with a Colorful Easter Vase DIY Using Dollar Tree Items. I love finding items from the Dollar Tree that can be turned into pretty little treasures for our home. This is a simple craft and can be done with children whom can handle glassware easily. Cover your work area or use a paper plate to keep everything tidy and easy to clean up later. Wipe the outer surface of the candle holder to clean off any dust, fingerprint oils etc from the surface. Decide which color of paint you’d like to use for the vase, and add an even coat to the outside of the vase. Set aside to dry. If you’re using a sponge decide what size you’d like your circles to be and cut it from the sponge. This piece will be used later to add the dots/circles to your vase. If you are doing this craft with a group cut as many as you can from the sponge. Add another 2 layers of paint to the vase and let dry. Once you’re happy with the color of the vase you’re going to put a glob of the second paint on your paper plate/newspaper. Using the circle sponge pieces you cut earlier, dip it into the paint and apply circles all over the vase. Let dry. Once your vase is dried you can add fresh flowers, a potted plant, sit it on the countertop to hold little trinkets, add to your makeup vanity to hold your makeup brushes. The possibilities are endless and you can make this craft for any of the holidays just switch of the color theme to match the holiday. If you’d like to learn how to make the pom pom bunnies, or the 3D carrots treat boxes in the images click the links for detail instructions. We have some other fun Easter crafts that are easy and kid-friendly too. 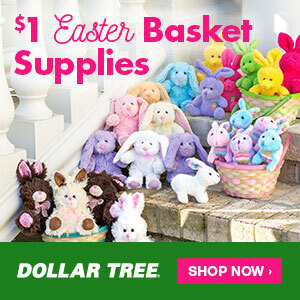 The Dollar Tree is also a great place to start getting some of your Easter Basket fillers too. You’d be surprised at the unique fun items you’ll find there. You can also order online and have items shipped directly to your home. Get a jump start on your Easter baskets this year. If you like this Easter craft made with Dollar Tree items be sure to check out my Dollar Tree Crafting series. I am constantly adding lovely crafts for around the home. I’d also like to invite you to follow me in the social media outlets located at the right side & lower parts of my blog.